Apple iPhones have always received a negative review from the critics when it comes to the camera. The iPhone being such a funky device, the 2 megapixel camera and the inability to zoom or autofocus is really a let down. 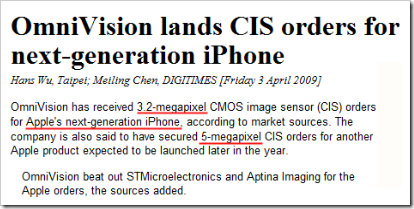 But according to a recent report from DigiTimes, Apple has secured an order with OmniVision for 3.2 megapixel CMOS image sensor (CIS) which will be used in the next version of the iPhone, which is expected to be launched in June this year. Other most possible new features in the new iPhone include Video Recording capabilities, a new battery technology, a 32GB model, faster Internet speeds, and the new iPhone OS. According to some other source, Apple has also secured an order for 5 megapixel image sensors for another Apple product to be launched later this year.